How do you solve a problem like science careers? 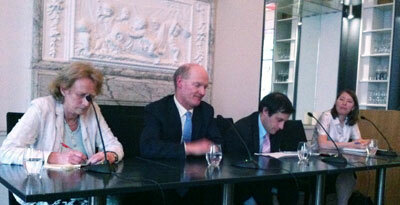 On Tuesday 24th May 2011, Dr Evan Harris chaired a panel discussion on careers in science at the Royal Institution. On the panel were Dr Jenny Rohn and Professor Dame Athene Donald, FRS, and they were joined by Rt Hon David Willetts MP, Minister of State for Universities and Science. About fifty people joined in the discussion in person, with questions and comments on twitter under the #scicareers hashtag. Science is Vital is not leaving the matter there, though: we want to maintain pressure on the government to consider not just science funding but the very real problems that exist in science careers. First up, the Minister asked Science is Vital to draft a document which we could deliver to his office summarizing the points raised at the Ri, which we can use for the basis of future discussions. To do this we need your help. Please tell us about your own concerns (and potential solutions!) about science as a career in this country, either in the comments below or (if you want to make your comments confidentially) by email to jenny ‘at’ scienceisvital.org.uk. UPDATE Check out the Pod Delusion podcast. Willett’s concern that allowing post-docs to apply for grants would lower chances PI’s getting them is non-sensical. If a post-doc gets a grant then they will become PI. (Universities won’t like this because they’ll have to change the post-docs employment status.) But surely grants should be judged on scientific merit rather than employment status? Isn’t the real reason for not allowing PDs to apply that they think the RCs will be flooded with applications, and admin and reviewing will become difficult. But v. few post-doc led grants would be funded because decision making is almost entirely based on track record. Encouraging entrepreneurship is something that the Conservatives are traditionally in favour of. Surely allowing postdocs in science to apply for and hold grants in their own name, as is the case, for example, for ESRC grants and outreach grants from many research councils, is surely an example of directly rewarding innovation and entrepreneurship. In my own field, astronomy, postdocs, and indeed students, have always been allowed to apply for telescope time in their own right. But, unlike the US, money to pay for the data to be analysed does not come with the telescope time. The mismatch between grant funding and getting data to work on means that inevitably data is sometimes acquired at considerable cost (8m telescopes, space observatories) by postdocs whose contracts end before the data is reduced and analysed. We could reward success and innovation by giving funding to those who are awarded time. This would also *save* on bureaucracy since you only review the proposal once – when the telescope time is awarded – and would ensure that valuable data is not left on the shelf by those proposing the observations. I’m sure there are comparable issues in other fields. One thing that was commented on yesterday but I didn’t feel the minister really accepted is the need for formal recognition of the many roles post-docs fill in addition to research. I think this does come under the governments remit because it basically boils down to employment practices. Yes post-docs teach but this is not always recognized or supported, additionally we teach the never ending supply of new PhD students and often technicians, as well as often having a role in ordering things and ensuring waste disposal guidelines are followed…I could go on but I won’t bore you! All of these things take time and take us away from our own research. We receive little or no recognition for that extra work, instead the university acts as if that is all done by the PI who might even get promoted on the back of a well run group which is publishing good research. I made a comment during the evening about the “numbers game” for PhD students and postdocs in my former field of atomic physics. The gist of my comment was that since there are a couple dozen people in the UK right now with permanent posts in atomic physics, and most of them have 2-3 PhD students, this implies that we’re producing almost as many new atomic physics PhDs *every year* as there are permanent posts in the field. It’s not quite as simple as that, of course. The field has been growing in recent years, so there are a few more permenant posts than there used to be, and also not every new PhD wants (or is suited for) a permanent academic job. But if even 50% of them do (and are), that’s a lot of frustrated people, and a lot of wasted money spent training them – unless we make sure that their PhD programmes leave them with the skills to do other things, too. I’m not sure that’s happening at the moment as much as it should be. Existing “transferrable skills” courses are often too vague and general to be of much use, and there’s little time in a 3.5-year PhD to do much besides research anyway. I’m also interested in raising awareness about possible alternative career paths for PhD scientists – including ways of continuing to do science outside the academic environment – since in all fields we are training many more willing and talented people than there are permanent academic jobs. I’m hoping to write an article about this topic for my magazine, Physics World, later in the year and would be interested in hearing your thoughts. Senior academics need to take some responsibility for the bleak career prospects of early-stage scientists. Academics are always asking for more grant money, and for the grant budget to be ring-fenced, so that they can hire more students and post-docs to do research. Nothing wrong with that – however, no thought is given to the careers of these people. Specifically, that some day they will want a permanent position at a university themselves. Unfortunately there are very few such positions available, due to funding constraints. At the same time, universities have in their employment many academics who underperform – have very little (or no) reasearch output, and do the bare minimum with regards to their teaching requirements. These people were hired during the boom times, and due to the generous employment terms in universities it is virtually impossible to fire them, or even to convince them to ‘up their game’. If universities had the power enforce performance on their permanent academics, and in the worst cases get rid of dead-wood, this would greatly benefit the universities and the tax-payer alike, as poorer performers could be replaced by good new people. These targets could even be extremely mild (e.g. co-author 3 papers a year, teach 2 courses). This is what happens in the private sector. However, the academics themselves (through their union) would never allow it. I was disappointed to miss this debate, I recently left london to take up a postdoctoral position abroad. I think a major problem in the UK is the lack of a sensible number of postdoctoral fellowships. This is one of the main reasons behind my move abroad. Ambitious scientists want independence and they want it NOW. Young scientists have good ideas but, at the moment in the UK, no outlet for them because they have to work on a project invented by their PI. Personally I believe a radical alteration to the way science is funded is needed. I’ve seen too many complacent academic sticking with their dead in the water research projects. I would create a specialist early career structure where young scientists can get money for, say, 3 years, based on a research proposal. Such grants would be available twice, consecutively. following this, money would be awarded based on the track record of the previous 5 years, accompanied by a short (2 page, say) research proposal. Having listened to the full podcast; the recurring theme from Willett’s was that it wasn’t up to goverment to intervene in academic matters. However, I think that many academics share researchers concerns, but are far removed from University decision making processes. The result of increased funding has been massive administrations at Universities which are not really accountable to anyone. Coupled to that, they do not value researchers, because they do not invest anything in them. Salaries are covered by research councils and “training” was covered by Robert’s money. The contribution made to RAE-based income by researchers is largely ignored, and credit goes to the PI entirely, despite the experiments, analysis, PhD student supervision, paper writing and grant writing having been at least partly done by the PDRAs in their lab. Should it be encouraged/allowed (no one in my Dep’t seems to know) for senior postdocs to be submitted to the REF in their own right, acknowledging their contribution and providing an income for their long-term support? This income, I think, is mostly spent on rewarding profs. Secondly, could the government keep a closer watch on “the value for money” they get in spending money on research, and the proportion that gets spent on “front-line” staff and equipment, rather than buildings and admin staff. (There could even be penalties). I think these two things would provide drivers for universities to value and support their researchers more. My university recently wrote a mission statement with a section on inclusion, which named specifically academics, administrative staff and students. In staff meeting, my comment about not feeling included in the inclusion statement was met with derision. Try thinking in terms of a medieval analogy: the king dashed across town from a soiree with the scribes to humour the serfs. “Nothing I can do” he said. The system, if you can call it that, seems to resemble the feudal system. Good points Matt. I too noticed the ‘its not my job; from WIllets, and I largely agree with him. One problem is that in terms of decision making in the scientific community, there is essentially no outlet for the views of postdocs. Postdocs are basically powerless in terms of ‘changing the system’, and as everybody notes, the interests of post doctoral researchers and PIs are not always aligned. In other countries such as the US it takes much longer than 3 years to complete a PhD – so when newly graduated students come over to the UK for jobs they out-compete our new graduates easily – we don’t have the lab experience, teaching skills, maths skills etc. that a new graduate may have if trained in another country. I have been told time and time again by members of my department that PhD graduates from other countries are better trained than UK graduates. 4-year funded studentships should become the norm, and perhaps longer, including compulsory training in specific skills related to your discipline (maths/statistics (all scientists should have a basic level of mathematical/statistical understanding), lab skills, team working, leadership skills…) This would produce a more rounded individual at the end of their PhD training, and make them more employable both inside and outside of academia. Also, permanent positions for post-docs/lab technicians at universities should be available – the lab would not function without them. I know people on rotating 6-month contracts, and the uncertainty surrounding their jobs can affect their work and their health. Also, less training would be required – as you would not have to train new people every time someone comes to the end of their contract. Hard working people should be rewarded; it is unfair that the only academics with permanent contracts are the PIs. This would be an easy area to save money on so more is available for salaries!! Hi, this sounds very worthwhile – we have advertised the link across our networks and hope you get good contributions. She is someone who gave up a science career to care for children. She has done lots of other things but at a price. As she says, the workplace needs serious restructuring.